What are flavones, catechins, anthocyanins, and those healthy plant compounds? Many of the healthy compounds you hear about are all unique compounds that share similarities in how they are shaped and (thus) how they function in the body. Each compound is unique, but those in certain 'classes' share similarities with each other. For the purpose of this article, we will break things down into 'tiers' for comprehension. To investigate compounds further, please go through their respective pages. The first tier is with the ultimate parent compound, the 'Flavonoid' and sometimes referred to as 'Vitamin P'. It is broken down into three subcategories based on how one ring is adhered to the center ring structure. Image credit goes to this study, with some modifications for neoflavonoids. When the ring is adhered to the 2 carbon, it is a Flavone, when adhered to the 3 carbon, it is a Isoflavonoid, and when adhered to the 4 carbon, it is a Neoflavonoid. All these compounds are Flavonoids, but they are different types of flavonoids. All the above compounds have ketone groups, which are oxygen atoms double bonded (indicated by an O connected by two lines) to a carbon that is not at the end of a chain, and somewhere in the middle of the structure. If a molecule loses its ketone group, its name gets an A in place of an O. Flavonoid turns into Flavanoid, and Flavonol turns into Flavanol. 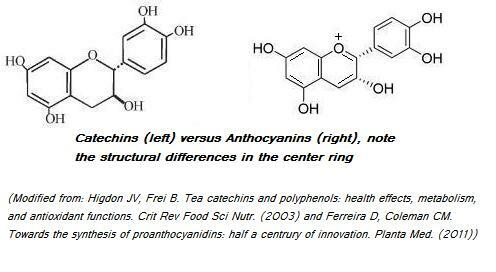 Although Anthocyanins fall under the flavanol/catechin category, they have two small changes (a double bond between C2 and C3 on the center ring, and a protonated oxygen on the same ring) that result in quite different effects in the body. Due to this, anthocyanins are sometimes seen as their own subcategory. Not much is known about neoflavonoids at this point in time, thus succinct information about compounds derived from neoflavonoids is not available. If a bioflavonoid has a 5-carbon ring in the center rather than the typical 6-carbon ring structure, it is known as an Aurone.